Today, Star Wars™: The Old Republic™ is celebrating its five-year anniversary…and it is hard for me to believe that I am the one with the honor of writing this – the Five Year Anniversary Producer’s Blog. I started on this project six years ago, excited, enthusiastic and energized – this was the realization of a goal I had pursued for years. I knew fate had smiled on me when I became part of the BioWare team I had admired for so long, working together with the amazing team at Lucasfilm to create a game in the Star Wars™ universe, the most beloved galaxy in all of fiction. Giving gamers the chance to live out their own Star Wars story adventures in the Old Republic universe has been a truly incredible experience, and one for which I’m deeply grateful. That was our mission and the beginning of this amazing journey. As I look back on the past five years that have led me from launch crunch, to the reincarnation of Revan and on through the delivery of six expansions including notorious Hutts, the re-awakening of an evil Emperor and the introduction of the most evil family in Star Wars - I realize that there is one part of this journey that stands out for me above all others…the relationship I have with you, the fans. My work on this game would not be as rewarding or as humbling, and definitely not as challenging (!) were it not for all of you and your commitment over the years. Building a game that evolves over time and continues to grow along with the community is a rare experience and one that I will be grateful for being a part of for my entire life. For those of you who have seen me at Cantina events or on our livestreams, you know that at times it takes the stoicism of a Jedi Master, which I am not, but it has taught me so much about the value of community and commitment. It is with that humble and grateful heart that I want to say thank you to all of you for being here over the years to share the journey with us and to help us translate the epic adventure that is Star Wars into a game you could love and share with your friends and families. In honor of the Five-Year Anniversary we have lots of rewards to share with you in the game today; my favorite is the ‘Celebration Jawa’ – but there are tons more. 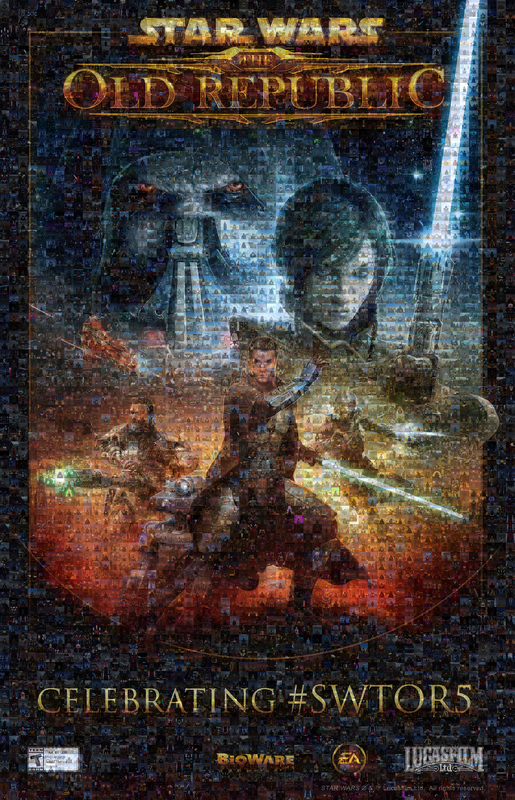 Plus, we are premiering the official Star Wars: The Old Republic Character Portrait Collage today for its first reveal – this is a collage made up of player characters that you have sent us that have been brought to life in this game. This game is the tapestry of your stories, your adventures, your achievements and your commitment to us, the game and Star Wars! I’d like to wish each of you an amazing holiday and I invite you to share the joy of a great story with someone you care about this season as we open our Chapter 1 Trial of Knights of the Eternal Throne and prepare for more adventures to come in the New Year! May the Force™ be with You! I’d like to wish each of you an amazing holiday and I invite you to share the joy of a great story with someone you care about this season as we open our Chapter 1 Trial of Knights of the Eternal Throne and prepare for more adventures to come in the New Year! EQUAL TO WATCHING ALL 7 STAR WARS FILMS 22X! Log in between December 13, 2016 – January 16, 2017 and visit the Anniversary vendor on the Republic or Imperial Fleet to claim your rewards. 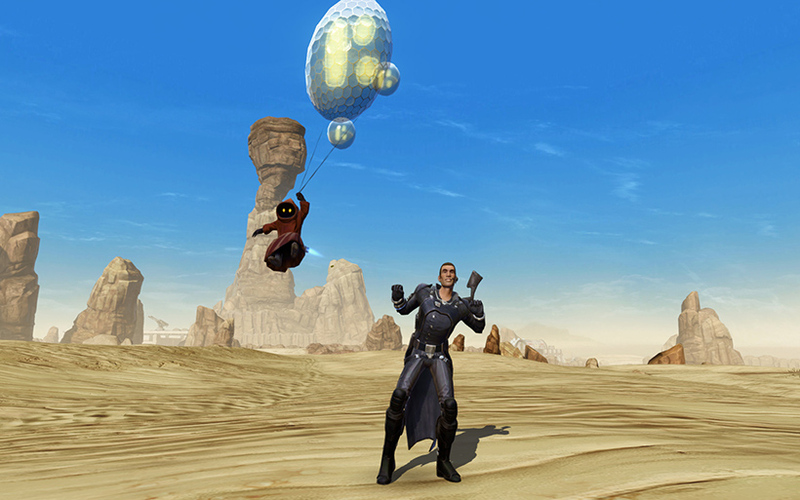 With golden balloons in hand, this 5-Year Anniversary Celebration Jawa has a fun animation that will kick off your festivities in style! 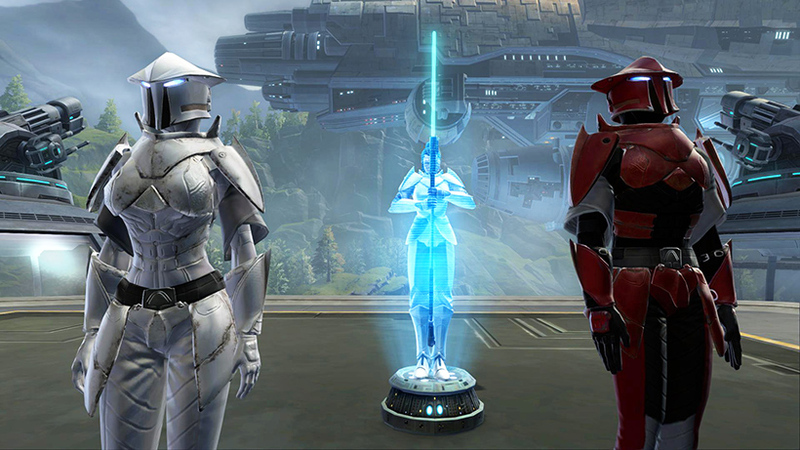 Tap into Senya’s years of wisdom and knowledge with the new Senya HoloStatue and train in your class abilities immediately from anywhere in the galaxy as you level up and grow your power! 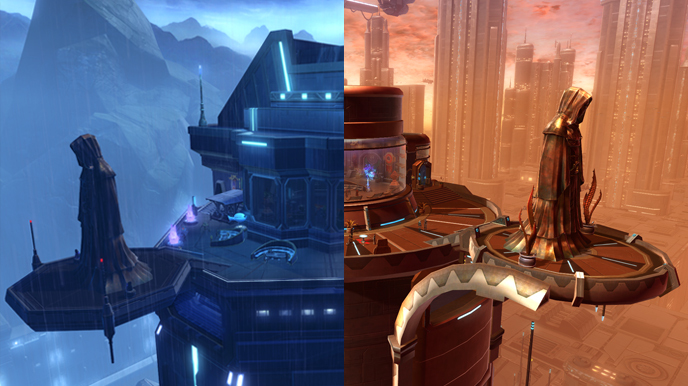 CORUSCANT AND DROMUND KAAS STRONGHOLDS: ONLY FIVE CREDITS EACH! Purchase your very own Coruscant and Dromund Kaas Strongholds from the “Strongholds Terminal” for only FIVE CREDITS each. This is your chance to own your own piece of the Republic and Imperial capital worlds! As a special thank you to those players that have been continuous Subscribers since launch**, we want to show our appreciation with an exclusive Galactic Alliance Statue decoration that you can proudly display in your Strongholds! Visit your in-game mailbox to claim your Statue beginning December 13th! 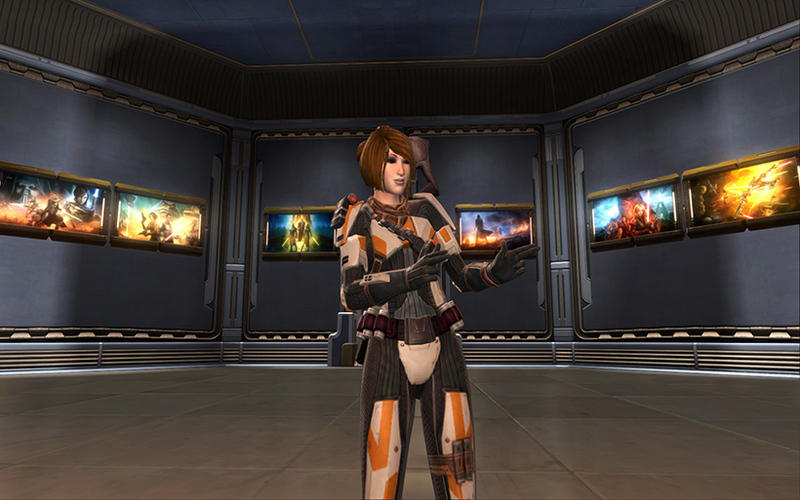 The 5-Year Distinguished Veteran “Galactic Alliance Statue” reward is delivered via in-game mail. NOTE: To claim your rewards, use the “Emergency Fleet Pass” ability located in your ability list (Type “P”) to get the Republic or Imperial Fleet. Then, visit the “Strongholds and Crew Skills” area of the Fleet. Visit the Strongholds terminal to purchase your very own Coruscant and Dromund Kaas Strongholds for only FIVE CREDITS each. Then, visit the “Anniversary Personnel” vendor to claim your 5-year Anniversary Party Jawa, Senya Holo-Statue and 7-Piece Poster Art Collection. 5-Year Veteran Subscribers – visit your in-game mailbox! *The 5-Year Anniversary promotion for Star Wars: The Old Republic begins Tuesday, December 13, 2016 and ends Monday, January 16, 2016 at 11:59AM PST / Tuesday, January 17, 2016 at 7:59AM GMT. Players must be at least Level 10 to get to the Republic or Imperial Fleet and may unlock up to 50 of each decoration poster reward for their Legacy. This offer is for promotional purposes only and does not have a cash value. May not be combined with any other promotional or discount offer, unless expressly authorized by EA; may not be combined with any prepaid card redeemable for the applicable content. **To qualify for the “Galactic Alliance Statue” 5-Year Distinguished Veteran Reward, players must have become a SWTOR Subscriber within 90 days of the game’s official launch on December 20, 2011 and remained a continuous Subscriber as of Sunday, December 11, 2016 at 11:59PM PST / Monday, December 12, 2016 at 7:59AM GMT. Qualifying Subscribers include players who have purchased a product subscription or redeemed a pre-paid game time code. To celebrate over 87 MILLION unique characters created by all of you, we’ve created the #SWTOR5 Character Portrait Collage! From heroic missions that force you to make life and death decisions, to intense Force™ battles across the galaxy, now is the time to experience the deep storyline and exciting gameplay that puts you at the center of your own personal Star Wars story. "Hero's Saga" Trailer Can you save the galaxy from a dark destiny? “A Galaxy of Possibilities” Trailer: A Galaxy of Possibilities Awaits You! Can you save the galaxy from a dark destiny? The battle intensifies as the Outlander and his Alliance move closer to the ultimate confrontation in Star Wars: The Old Republic – Knights of the Fallen Empire. Assemble your army, fight alongside hand-picked allies, and watch your choices shape the fate of the galaxy! Jump into a deep and personal BioWare-style story where you’ll travel to the Outer Rim of the galaxy to come face-to-face with a new threat, Emperor Valkorion and his Eternal Empire. Your character will start its journey to becoming the Outlander, a veteran of the Great Galactic War, as you discover that the Eternal Emperor’s dark destiny is tied to your own. Your character will become the Outlander, a veteran of the Great Galactic War. Travel to the outer rim of the galaxy and come face-to-face with a new threat, Emperor Valkorion and his Eternal Empire, only to discover that his dark destiny is tied to your own. Choose your path, join companions old and new, and shape the future of the entire galaxy, all at the center of your own personal Star Wars saga! A Galaxy of Possibilities Awaits You! Step into the Star Wars™ universe and play a role in the ongoing battle as you start your own personal saga. Play now as a Jedi, a Sith, a Bounty Hunter or as one of many other iconic Star Wars roles and experience the action-packed adventure that awaits you in Star Wars: The Old Republic! In this prequel trailer to the Star Wars: The Old Republic - Knights of the Fallen Empire Digital Expansion we introduce you to the tragic destiny of twin heirs caught in a web of evil and manipulation spun for them by the darkest and most powerful Emperor yet to threaten the galaxy. Conquest comes at a price, only accessible for those willing to sacrifice….everything. The Battle of Alderaan. The Republic's gravest hour. Recently promoted to Darth, Malgus launches the first of many surprise attacks that would become his trademark during the Great War, perfectly timing the assault with a feint that pulls the Republic fleet light-years away. Thousands of assault droids and hundreds of Sith set the heart of the Republic ablaze, and Alderaan's few defenders are swept away with ease. With time running out and Alderaan's capitol threatened, it falls to Havoc Squad, the elite Republic Special Forces unit, to coordinate one last desperate stand against Malgus' vastly superior numbers. The Sacking of Coruscant. It was the crowning achievement of the Sith Empires ambitious military strategy and the moment that changed the history of the Old Republic forever. Our first cinematic trailer captures this event with breathtaking action and beautiful detail.